We've been moving around a lot this week, so what follows is a general update of our journey. After several days in Boston Harbor, we left Wednesday morning for a bit of South Sound exploring . It was warm and calm, so we wound up motoring up to Jarrell's Cove on the northern end of Hartstene Island. The State Marine Park lines one shore and a private marina the other. We snagged one of the many buoys and avoided the power boaters on the two park floats. We intended to kayak the long clear fingers of the inlet, but a very low (-3) tide left the ends dry, so we took the dinghy for a row and spent the rest of the night enjoying the still, still quiet. Thursday evening we joined my library mates for a BBQ at Patty's waterfront house. Late that night Raina drove us back to the marina. Though it was raining and rather cold (damn will summer ever settle in?!) 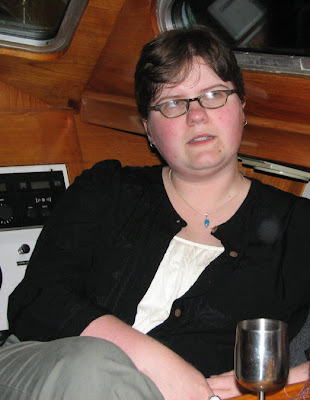 Raina braved the dinghy ride to come aboard for drink and some philosophizing. Friday morning we took off with Boston Harbor as our destination where we needed to pick up a couple gauges that had been shipped in for the fuel filters. Much to our surprise we hit some 20 -25 knot winds in Case Inlet and our first real taste of sailing! Steve delighted me by letting me have a go at handling Nomadness under some gusty conditions. I loved it! She sails like a dream, heels gently and remains steady at 7 knots. The winds were a bit squirrelly requiring close attention, but the water was amazingly smooth, no chop at all. Even with my novice clumsiness, she held nearly 4 knots through tacks and kicked up her heels right away. We decided to furl in the sails upon entering the narrow and busier Dana Passage because we wanted to practice pulling them in under some load. The jib furled in easily just like it is supposed to. Before bringing in the main, Steve decided to start the motor in case we needed some power to keep her pointed up wind and went below to do so. I held the helm waiting... nothing. "Steve, is everything ok?" No response. I saw him opening the engine compartment--never a good sign. Then he popped up to say, "There's nothing. Nothing. Not even a click." Very quickly I assessed our position to the lee shore, the wind direction, our speed, the depth. I determined I could tack and keep us sailing under the main for quite awhile if need be. "We're ok," I called. "No, we're not. The engine won't start," he replied. I assured him all was well outside, and he had time to figure out the problem. Steve fiddled with the fuel solenoid which has stuck in the off position before, but that wasn't the problem. He checked connectors, batteries and whatever else he could think of that might inhibit power. No luck. He threw all the breakers and tried again. Vrooom! She started. Probably just a coincidence, but at least she was running. We brought in the main and motored the last mile or so back to Boston Harbor. After circling a couple times, Steve docked without incident. The Marina was hosting a BBQ so we joined the locals for a bite and beer as the winds died out and the sun set behind the Olympic Mountains. It had been a great day. "We survived another one," Steve proclaimed is his usual dramanautical way. Another party ensued with Scotty, Chuck, Suzanne, Raina (who came back for more), Kelly, and young Rebecca aboard. Tales were told and spirits consumed. 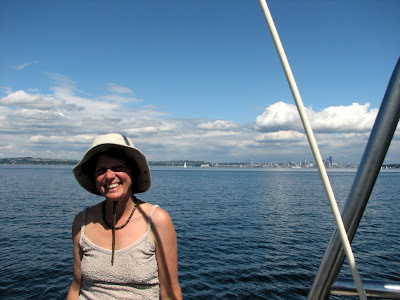 Saturday we headed out early with tide under sunny skies and cruised through the Tacoma Narrows at 9 knots. 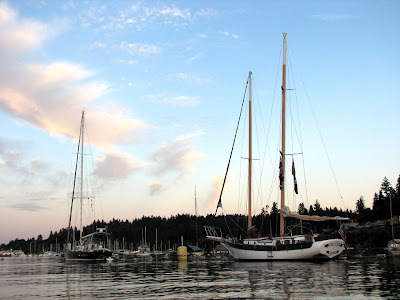 We arrived in Eagle Harbor early evening and grabbed the linear buoy again. Steve met up with his geek comrades, Dave Warman and Charlie Faddis, while I went to the Lynnwood Theatre and saw "Roman De Gare" a french thriller by director, Claude Lelouch. 'Twas exactly what I needed, thanks TJ! Since I do intend to actually write screenplays, I better get out to the cinema once in awhile. 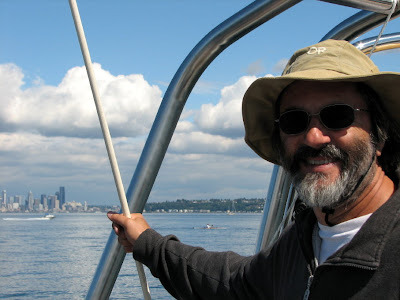 Sunday we sailed in light winds around Elliott Bay dodging ferries in slowmo and generally having a great day sailing up to 7 knots in light wind! Steve did some nice maneuvering to get us docked and proved that this big girl will back up if you give her enough thrust. (Like any ole stubborn gal, I guess!) Currently, we are in Shilshole Marina. Sean, our cheerful and capable mechanic from Hatton Marine has just arrived to put the injectors back in. Woo hoo! We'll be back on the water in no time, and without that embarrassing smokey exhaust problem.